The passage of the Every Student Succeeds Act (ESSA) makes Title I and II funding available for pre-K and early elementary education, therefore increasing access to pre-K programs and professional development resources. To support the effort by the U.S. Department of Education to jump-start elementary teaching and learning, Califone International LLC introduces its Kids Headphone. The 1534BK headphone is smaller in size and durable to fit the needs of younger listeners. Designed for comfort, the 1534BK headphone includes a headband with slightly less inward pressure than models for older students, but still enough to block external ambient noise. The headphone has cushioned circumaural earcups and an adjustable headband that fits smaller head sizes. The earcups block ambient noises, helping students stay on task while also reducing the need to increase the volume, therefore protecting their hearing safety. The Kids Headphone comes with a three-year warranty to provide teachers and students a long-lasting model built for the classroom environment. It also features slotted baffles to protect its internal speakers from accidental damage associated with prying fingers. 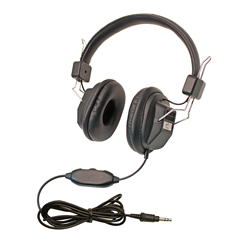 The 1534BK headphone has a six-foot cord, so it is lengthy enough to be used with laptops, and is accessible for mobile learning. It is compatible with iOS, Android and Window-based devices. For more information on the new headphone model, full line of Califone products, and to view and download the complete Califone catalog, visit http://www.califone.com.